Oriens Aviation’s exclusive British Isles Pilatus Centre formally opened this February at London Biggin Hill Airport and reports a strong nine months supporting a greater number of customers for maintenance and technical support. It is now supporting 12 PC-12 regular customers, including 10 on the UK register – double the number since the start of this year, including two new arrivals now flying with private customers. Oriens Maintenance, which complements Oriens Aviation’s sales activity as exclusive Pilatus PC-12 distributor for the British Isles, has also extended support to Swedish, Finnish, Swiss and N-reg US PC-12 customers since the start of the year. Adhering to the Swiss OEM’s newly revised maintenance inspection schedule for all PC-12 series, which reduces the timing of inspections from 100 to 300 hours, Oriens finds it has more capability to handle other aircraft types too. So far this year the business has carried out MRO checks on a Hawker 1000, Cessna Citation 500, Beechcraft 99 and Cessna 421. 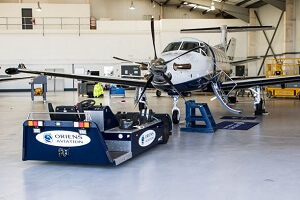 “We are keen to widen out our EASA capability and support types such as the Beechcraft 90 and 200 series, plus the Cessna 208 Caravan,” said Oriens’ maintenance manager, Steve Westran. Responding to stepped up demand for remote support and in readiness for the winter months, Oriens Maintenance is investing in a larger Mercedes van which will be equipped as a mobile workshop. This is due to arrive later this month.